The California nameplate has been retires, and along with it, the California T. In their place, Ferrari has launched the Portofino – a gorgeous front-engined 2+2 GT car that looks as stylish as its namesake, a small coastal town in Italy. It’s the new ‘entry-level’ sports car for the Prancing Horse, and the Ferrari DNA is unmistakable. But along with good looks, it also introduces a new iteration of Ferrari’s turbocharged engines in a front-engined, rear wheel drive platform for those who want their exotic sports car to be a little more day-to-day orientated than the 488 GTB. The Portofino retains the 2+2 seating arrangement of the California T it replaces. But once again, like the Cali-T, the space available in the rear seats is suited to double leg amputees only. But, the rear seating space does afford an extra bit of luggage space – which may be necessary if you don’t buy the matching Portofino luggage that fits perfectly in the trunk beneath the rear deck lid. Within the main cabin, the front two occupants have decent enough space in a low-slung sports car environment. Passengers are now included more in the driving experience with the available passenger display – as per the GTC4Lusso – whereas the primary infotainment is taken care of by a new 10.2-inch touch screen. Standard 18-way power adjustable seats are sporty, but err on the side of comfort, whilst a wind deflector reduces air flow and noise within the cabin by up to 30% when the folding hard top roof is down. The Portofino debuts Ferrari’s third generation electronic rear differential (E-Diff3) alongside the F1-Trac stability control system and magnetorheological dampers. The former pairing enhances the Portofino’s breadth of ability as a sports car, allowing for sharper cornering and enhanced handling at the limit, whereas the dampers offer the two-fold effect of providing exceptional support under vigorous driving conditions, and yet being able to settle the Portofino to a comfortable luxury cruiser thanks to the ‘bumpy road’ setting synonymous with Ferraris. Handling is further aided by reduced weight of the new platform, which is also stronger and offers more torsional rigidity than the California T it replaces. 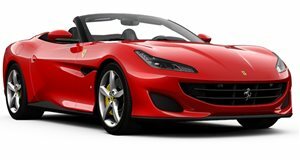 What remains to be seen though is whether Ferrari can pull off electronically power assisted steering, which has been included in the Portofino for the first time on any Ferrari. As the second in its line to feature turbocharging, the Portofino boasts a healthy torque figure of 561 lb-ft of torque. It’s thanks to a revised version of the 3.9-liter twin-turbocharged V8 from the California T that now develops 592 horsepower courtesy of a new intake system and new pistons and con-rods. Despite being a luxury grand tourer, 0-62mph is dispatched in just 3.5 seconds, before the Portofino stretches on to a top speed north of 200mph. Drive is sent exclusively to the rear wheels via a revised version of Ferrari’s 7-speed dual clutch automatic transmission. Naturally a full range of customization is on offer for the Portofino, inside and out, but Ferrari has also upgraded much of the basic equipment. In addition to the new infotainment system – featuring Apple CarPlay functionality – and the passenger display screen with interchangeable displays, the air conditioning system has also been revised to improve levels of comfort with the roof open or closed. There are also the standard safety items such as airbags, ABS brakes with EBD, and of course the F1-Trac stability control setup. The Portofino has not been crash tested. No longer is the Portofino that ‘girly Ferrari’ – the macho styling and uprated performance give it a firm title as a genuine sports car, whilst the improved rigidity and handling give it a dual personality that makes it a true Ferrari in both appearance and behavior.